Some of life’s most wonderful things are Open 24 Hours. Fast food, drive thru’s, car washes, White Castle, internet forums, and most importantly: the ability to wrench and drive. You’re a car nut who eats, sleeps, and dreams racing (ok… maybe just the last one), and for you, it’s a 24/7 job. To celebrate the upcoming Rolex 24 at Daytona , we’ve partnered with RACER Magazine – the definitive source for all things motorsport-related, and Blipshift – the source for motorsport tee designs – on a unique, creative promotion. 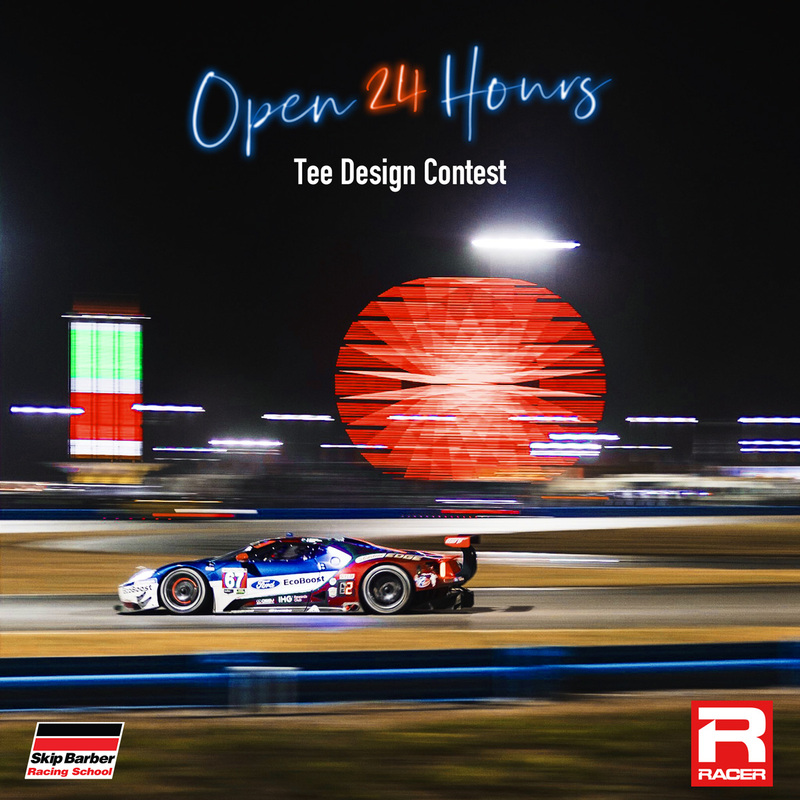 We want to see your best designs that center around the day in the life of a racing enthusiast in the Open 24 Hours Tee Shirt Design Contest. Submit your entry here at the Open 24 Hours contest page, on Twitter, or Instagram with the hashtag #OpenFor24. The entry deadline is Sunday, February 3rd at 10:00 PM ET. Check out the Official Rules for all the deets. Good luck! You can vote for your favorite designs! However, votes do not count, and contest winners are determined by a judging panel comprised of some smart folks from RACER Magazine and Skip Barber, as well as a couple of “art” majors from Blipshift. All entries are subject to review to ensure that they meet the contest rules and requirements. Any entries not in accordance with these regulations will not be chosen. Two runners-up will receive $50 Blipshift gift cards. Contest open only to US residents and those 18 years of age or older. Refer to the Official Rules for all contest guidelines and regulations.